Even designers, copywriters, and other creative personnel who are great at producing a piece of content can stall out when it comes to revisions. Often revision requests are unclear or conflict with each other, dissuading your creative personnel to tackle changes. It’s also common for revision requests to come back with no deadline, and for creating new content to take precedence over making changes to completed pieces. It’s also possible that your content creator may not have a good way to keep work that’s coming back for revisions organized. Reviewing content should take less time than creating it did, right? Often, but not always. If your reviewers are unfamiliar with the content and unsure of why they’re being asked to review it they will likely hesitate to provide feedback. Additionally, if it’s simply not a priority for them in respect to their other workload, it may sit on their desk for a while. You can also hit snags if the piece is difficult for them to access (like if it needs to be downloaded or accessed through FTP) or difficult to provide feedback on (like video and Flash content). While it can be helpful to have people outside the content creation and review process involved in a project to manage deadlines and resources, when it comes to routing content these staff act as another gate and potential delay. For instance, a project or traffic manager may be responsible for making sure that a revised piece gets forwarded to the legal team for final review – but that’s not going to be instantaneous. And every minute that revised piece spends in the project manager’s inbox is time that it could be spent under legal review. In future posts, we’ll discuss how you can address and mitigate these bottlenecks. 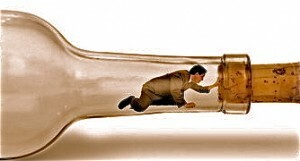 What bottlenecks do you run into in your review and approval process?